Brush up on your Spanish-English shoe terms, starting with men’s shoes. 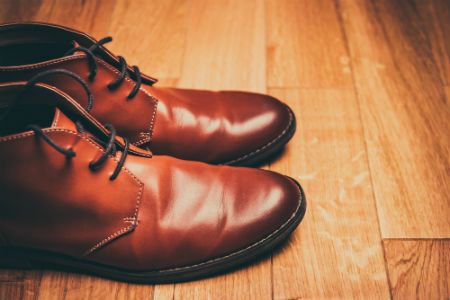 From shoes for weddings to footwear for the office, or just to look seriously snazzy, men’s formal footwear, or “dress shoes” are an important part of menswear. If you’re looking to increase your understanding of Spanish-English shoe terms, read on for the terminology you need to know. Men’s shoes are an important part of a formal look. 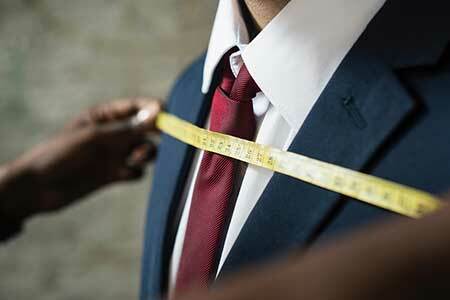 You can choose the best suit, shirt and trousers, but get the shoes wrong and the whole outfit is wrecked. As you’ll see in my article about formal menswear, “Spanish-English Fashion Translation: Personal Tailoring”, there’s a lot of specific terminology involved in this area. Men’s footwear has differing levels of formality. This introduction is going to focus on formal footwear. 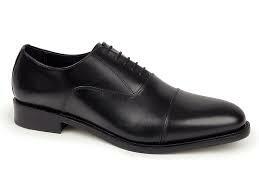 The most formal men’s shoes are made from leather and have laces (cordones) and Prussian seams (costuras prusianas). There are two types of formal men’s shoes with laces: Derby shoes and Oxford shoes. 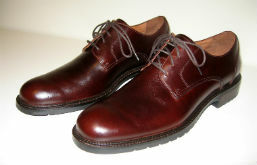 Oxford shoes are also known as Balmorals. Both types of shoe have a vamp (empeine). This is the front part of the upper (pala). It’s attached to the quarters (contrafuerte), which is the part of shoe covering the heel and joining the vamp. There are two types of formal men’s shoes with laces: Derby shoes and Oxford shoes. On Oxford shoes, the shoelace eyelets (ojales) are attached under the vamp. This is called closed lacing (solapas cerradas). There’s a separate tongue piece (lengüeta) underneath. With topstitching (pespunte) across the toe (puntera), they’re the standard laced shoe. 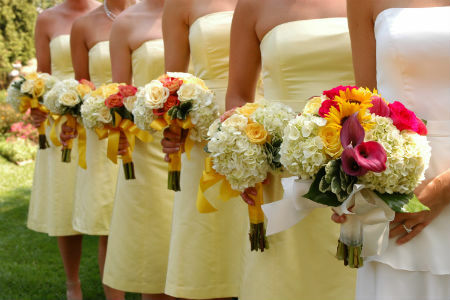 They can be worn for formal office wear, or as occasion wear with a morning coat (chaqué). Oxford shoes have a non-rubber sole (suela) and a low instep. Derby shoes have open laces (solapas abiertas), where the eyelets are attached to the top of the vamp. They’re sometimes called bluchers. What’s the difference between Derbies and bluchers? Well, a blucher has open lacing and the vamp is made from a single piece of leather. The Derby shoe, on the other hand, has large quarters rather than a single-piece vamp. American English uses blucher for Derby shoes and for what Brits would call Oxford shoes. You might have heard of brogues. It means a shoe decorated with perforations (troquelado), stitching or serrated details. Oxford, Derby, ghillie and monk shoes can all be brogues if they have this type of decoration across the upper. Brogues are thought to originate from Ireland and Scotland. It’s believed that they were worn by agricultural workers and the perforations helped the water drain away. Brogues can have varying amounts of embellishment. From quarter brogues with detailing only on the seam across the toe, to half brogues, with a brogue medallion on the toe and sometimes on the other seams too. 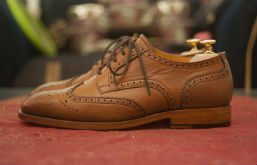 Wingtips (sometimes called full brogues) are a type of brogue with the decorative detail on an extended toecap. The broguing creates a “W” shape with the toe-cap section. The less detail, the more formal the shoe, so brogues are a less dressy style of footwear than plainer models. American English uses blucher for Derby shoes and for what Brits would call Oxford shoes. More formal than a Derby but less formal than an Oxford shoe is the monk strap. These shoes get their name from the typical style of buckled shoe worn by monks in centuries passed. 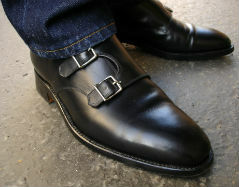 Monk straps are fastened with buckles (hebillas) rather than laces (cordones). They might have one, two or three buckles. A single monk strap gives a more timeless, understated look. More formal styles have less detailing, although there are wingtip monk-strap shoes and even monk-strap boots. Another type of dress shoe without laces is the loafer. This is a type of slip-on shoe with a moccasin-style upper. What’s the difference between loafers and moccasins I hear you ask? Well, what sets loafers apart from moccasins is that loafers have no detail on the upper, and a slight heel. 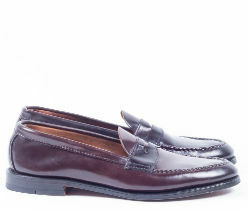 Classic styles include the penny loafer and tassel loafer. Again, once you add details like tassels (borlas) then the shoe becomes less formal. Remember, the plain Oxford in shiny leather remains the more formal style. Men’s formal shoes are made of leather (piel) or suede (ante). As I said earlier, the shinier the leather, the more formal the shoe, so suede is slightly less formal than glossy leather. You’ll also find more exotic materials such as snakeskin (piel de serpiente). The lining (forro) should be natural leather or calfskin (piel de becerro). 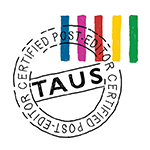 For a glossary of footwear vocabulary, check out this website. It’s in English only but has a good range of terms with explanations. I hope you’ve found this introduction to men’s formal footwear useful! 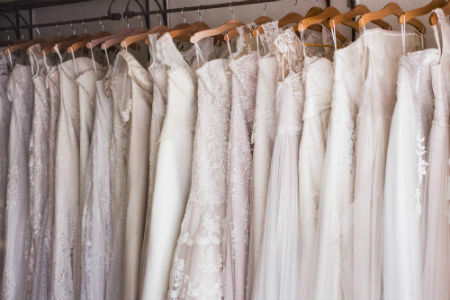 If you would like to read more fashion terminology articles, check out “Spanish-English Fashion Translators: Weddings” and “Translating Spanish-English Fashion: Bridalwear”. I’d love to hear any comments you have!